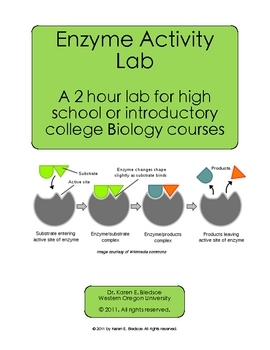 In this original, field tested lab, student first simulate enzyme activity with hands-on models, then experiment with real enzymes as they use lactase and amylase to digest lactose and starch. 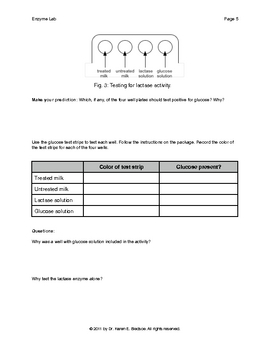 Students will learn that 1) enzymes are proteins, 2) enzymes catalyze biochemical reactions, and 3) enzymes have specificity. The lab requires approximately 1.5-2 hours to complete, longer if more time is given for discussion. It is suitable for introductory college biology courses, particularly with nonmajors, and for high school biology classes. 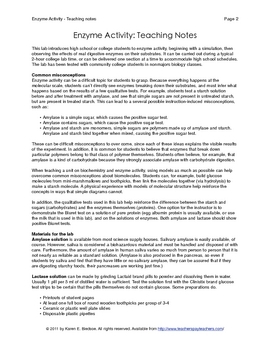 It can be delivered as one 2-hour lab, or split into two or three sequential activities to fit a high school schedule. A teaching guide, answer key, and student pages are included. 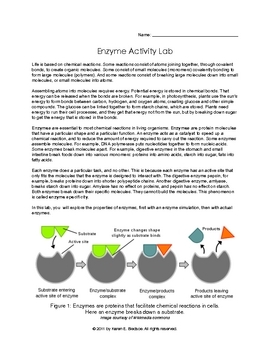 Enzyme Activity Lab by Dr. Karen E. Bledsoe is licensed under a Creative Commons Attribution-NonCommercial-NoDerivs 3.0 Unported License.